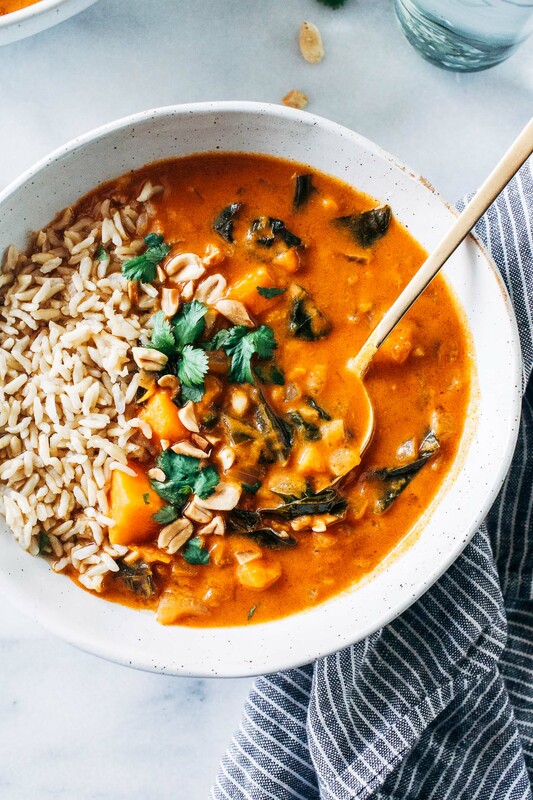 One-Pot African Peanut Stew- a warm and comforting meal that’s super easy to make. Vegan and gluten-free with oil-free option! Hey guys! I hope you had a nice Valentine’s Day. Or Galentine’s Day, if that’s more your speed. 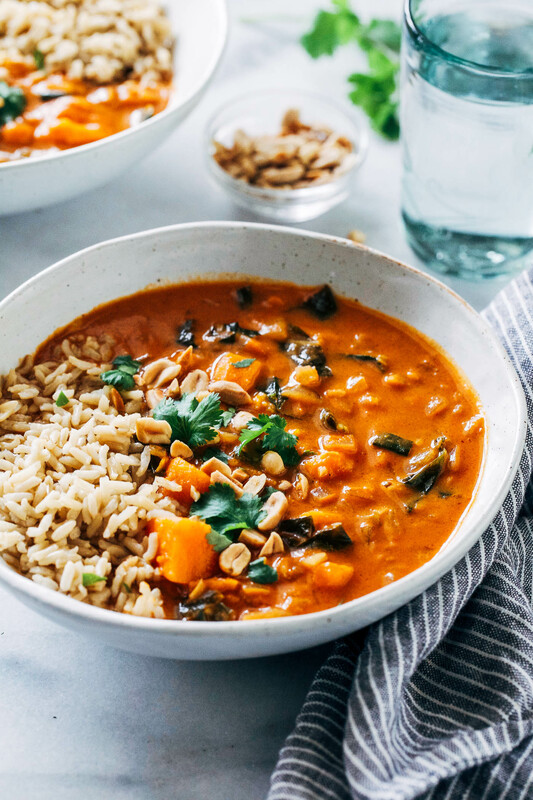 If you’re new to African Peanut Stew, I’m so excited for you try it! It’s extremely easy to make, hence the “One-Pot” in the title, and is packed full of healthy ingredients. It starts with a combo of fresh ginger, onion and jalapeño cooked in a broth with tomato paste and peanut butter. 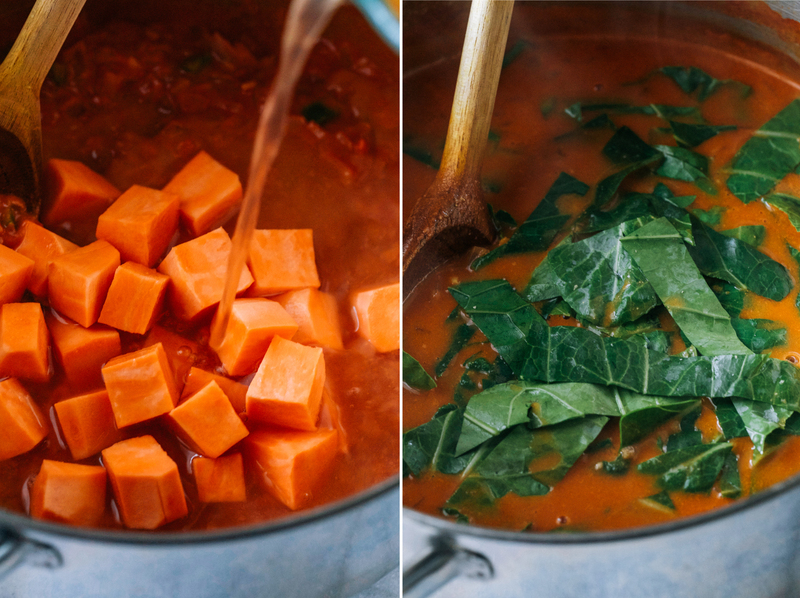 Sweet potatoes get added to the mix to help thicken the broth. Then we add fresh chopped collard greens for extra flavor and superpower phytonutrients. I know it might sound like a strange combination but you have to trust me when I say it’s amazing. It usually gets topped off with fresh cilantro and peanuts but I also like to add a squeeze of fresh lime juice. Something about that hint of sour goes so well with the savory tomato and sweetness from the potato and the peanut butter. Outside of the 15 minutes to prep the ingredients, you basically just throw everything in the pot and wait for it to cook. This recipe makes about 6 servings so you’ll have plenty leftover for lunch or dinner the next day. I haven’t tried freezing it yet but my suspicion is that it would hold up well! To make without oil: toast the cumin and cayenne in a large pot over medium heat for about 30 seconds. Add the 1 cup of water with the onion, garlic, jalapeño and ginger. Cook for 5 minutes. Add the tomato paste, peanut butter, broth and sweet potato then bring to a boil. Cover and cook for 15 minutes. Add the collard greens to the pot, stir, then cover and cook for another 15 minutes. Follow the last step and serve as directed above. This looks delicious. I’ve been meaning to try peanut stew for ages. Thanks Jo! It’s a good one. Hopefully you get a chance to try it! Ooh this looks awesome. Riley is so weird about peanuts or peanut butter in anything that’s not, I don’t know, a PB&J, so I couldn’t make this for him. I know I’d like it, though! 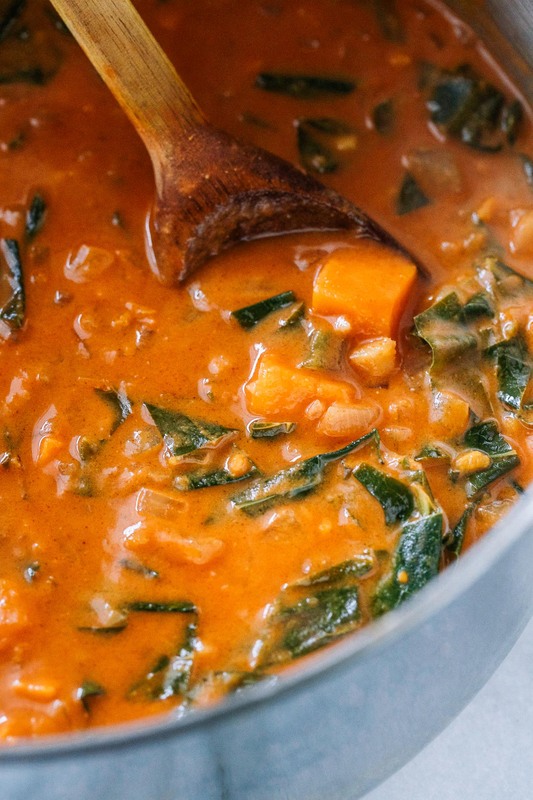 I’ve been meaning to try African peanut stew for YEARS!! It’s one of those dishes that has been very near the top of my To Make list, but somehow I’ve never pushed the go button. 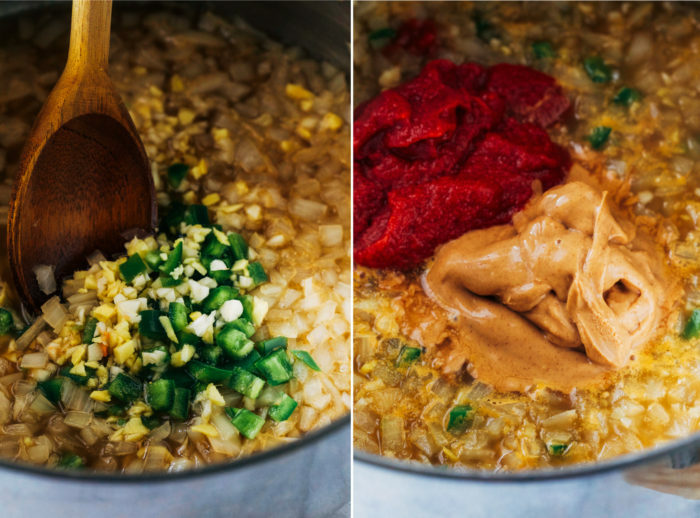 I seriously need to get on this asap – it looks sooo comforting and flavorful! 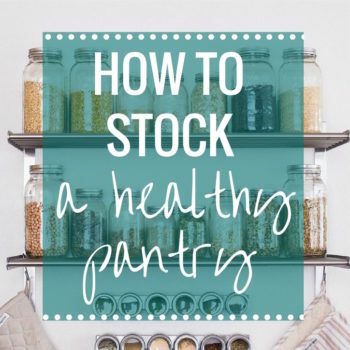 You make it look mega easy to prepare, too!! I have an old recipe on my blog similar to this. I remember thinking at first PB in a stew was so weird but it goes so well! It’s the ultimate comfort food. It is so comforting! The perfect cure for a chilly and rainy day which I see you are getting a lot of recently. Hopefully it’s not causing any floods by you! It’s been flooding nearby & some people come to work really late but none at my house, luckily! It’s crazy to think there is that much rain after how dry it was when we moved. I’m glad everything is okay with you! I love a good stew… I’ve been making so many soups/stews/broths on repeat because it’s been so darn cold here in Connecticut lately! Right! That’s all I’ve been eating too. It’s way too cold! 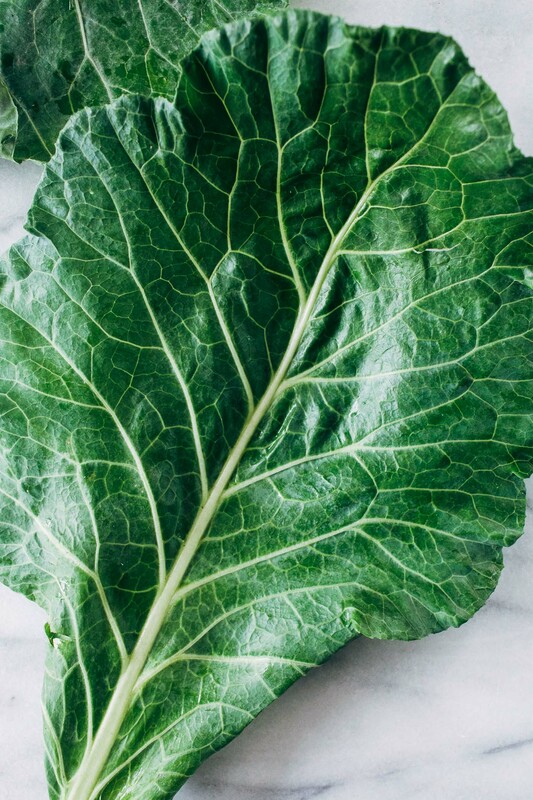 Do you have a substitution suggestion for collard greens? We don’t have a lot of those up here in Canada right now. I still can’t get over that! I thought if anywhere would have them, it would be NC. So weird! ohhh I love this! I feel like I don’t make savory PB dishes enough–clearly that must change! I was surprised at how good the PB is in this recipe! This combination really sounds delicious, Sarah. 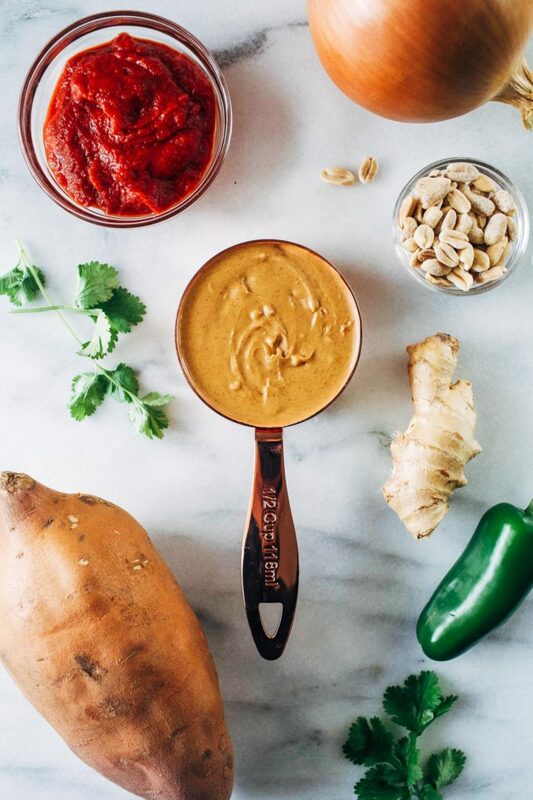 I mean peanut butter, sweet potato and ginger with all those spices? I’ve never had anything like this and I’m seriously craving it now! It’s so good, Marcie! I hope you get a chance to try it some time! So, my husband is totally obsessed with peanuts. Like, he eats them every single day when he gets home from work, so i’m thinking he would love this peanut stew so much! I’m obsessed with making one pot meals lately so this will definitely go in my recipe box! 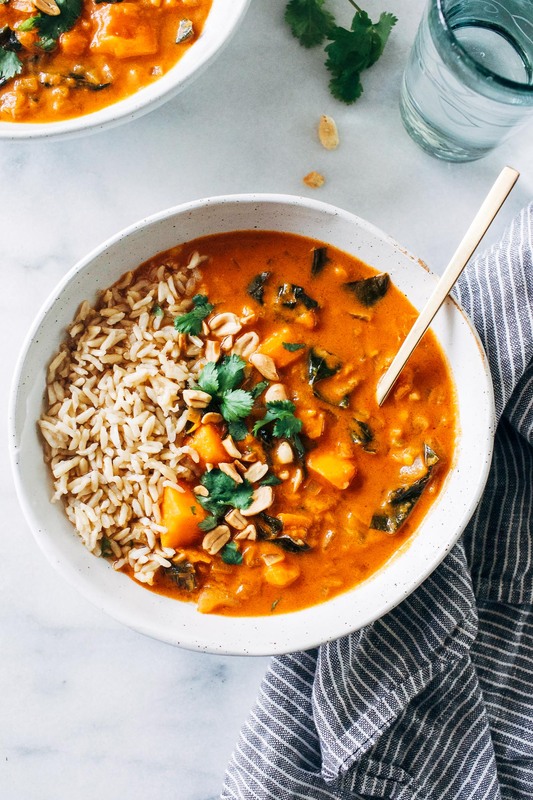 I love how healthy and yummy this stew looks! My hubby is weird about me putting peanut butter in stews and things, but I might need to try to sneak this recipe for dinner one night. I had been wanting to make this ever since I stumbled across this recipe. Finally, I’m there. It’s stewing with all ingredients and it already tastes great. Thanks for the recipe. You’re so welcome! Thanks for the comment, Anh! When I first heard of African Peanut Butter Soup, I could not imagine the thought of tomatoes and peanut butter together. Sounded totally gross. But a friend from Africa made it for me–and oh my goodness, soooo delicious! Yours is a little different and I look forward to trying it. Thanks. Could you clarify what unsweetened peanut better is? I have Jif natural and Skippy. Are those out of the question? Do I need to have done fresh peanut butter from a natural food store? Thanks! Hey Debbie! Unsweetened peanut butter is made without added sugars. I like to use that kind for health reasons but you can use what you have on hand. The recipe will be a little sweeter but should still be delicious! I would love to try this stew. Can I substitute the peanuts with cashews or almonds? I have a peanut allergy. Made a single pot and it was gone immediately. My son left for college right after having it and went to the store the next day and made it on his own so he didn’t have to share!! My brother then made it to see what the fuss was all about and said it’s a keeper. Originally I was looking for a way to use up some marinara sauce and a diff site had African stew with marinara as the tomato part but not healthy so I searched and found you. I used about 14 oz of the marinara instead of paste but just in the first batch. Second was made as is. My only other changes were that I didn’t have collard greens or jalapeños so I added more cayenne and just omitted the greens. Next time I’m doing it by the book. ;) Fantastic recipe and can’t wait to try more of your stuff. Thanks for sharing it! I forgot to mention I linked this recipe to a post I made on Facebook directing my friends here to check you out. Hope that was ok? I gave you all the credit with the recipe. Yes that’s great, thank you for sharing! We loved this! 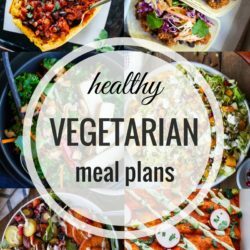 My meat eating family is looking for some satisfying veggie/vegan recipes and this fit the bill. Our local store didn’t have jalapeños so I used a dark green pasillo about twice the size of a jalapeño – I tasted it and it had NO heat raw. I used it all – about 1/4 cup. Also, cut the cumin in half and served it with plain yogurt. So good. I will definitely make it again. Hello, absolutely love this! Now making it all the time – thank you so much, friends are loving it too! Just one question, as I am a terrible cook, can you freeze it? Thank you so much , that’s fantastic news!!! Thanks for this! It has become the favorite recipe in my house, and even the most carnivore friends I have looooooove it, everyone just loves it! it’s so so good! plus it’s perfect for winter, thanks so much! I’m so glad to hear that. 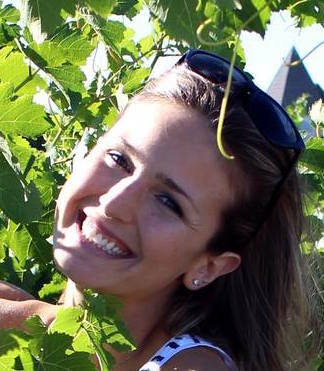 Thanks for the review, Raquel! I was honestly a little wary to try this because I thought it might be too peanut-buttery, but I actually ended up adding 3/4 cup of peanut butter and it turned out amazing. I also ended up doubling the tomato paste (used the whole 5.5 oz can) and left out the cup of water. Really, really good. Thanks for this! I’m so glad it worked out! Thanks Ashley! This was wonderful. I adapted it for the instant pot. I’m so glad to hear it works with the Instant Pot! Thanks for feedback, Emily! I can’t see what she said about timing on the instant pot but can you please let us know? How can this be IP converted? Sorry the comments aren’t showing up for some reason but I can still see them not the back end of my site. She didn’t mention anything about the timing, unfortunately. All she said was that she made it in the Instant Pot. I wish I had one so that I was able to advise you! This recipe is now one of my staples! I make it at least once a month. My boyfriend really digs it too :D Thanks for posting such a tasty dish! I’m so happy to hear that! Thank you for the review. This stew was delicious! I made it for a potluck lunch where there were several vegetarians, and it was a hit. The only change I made was substituting kale for the collard greens. Thank you for sharing this recipe. Sweet potatoes have always been my least favorite vegetable; one of those flavors that just catches in the back of your throat, you know? I tried this recipe as an experiment and it was amazing. I was completely blown away and finished it off by licking the bowl clean. 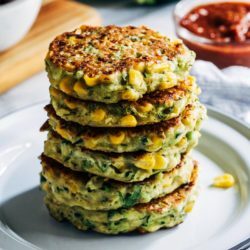 This will be one of my all time favorite go-to recipes from here on out. Made this last night. TO DIE FOR!!!!! Couldn’t get collard greens so used baby spinach and it was truly delish. It’s going in my regular dishes to make. Loved it. I’m so happy to hear that! Thanks for the review, Monica! This soup is SO good. I recall trying a similar recipe a long time ago and it didn`t turn out so well, so I was hesitant to try this. I`m glad I did because it is amazing. I added extra peanut butter and I add sriracha hot sauce to every bowl. Getting ready to make a second batch this weekend because I don`t even mind eating it two weeks in a row. Thanks for the great recipe. I’m so happy to hear you liked it! Thank you for the review! I made this tonight and it was absolutely delicious! The only thing I did differently was adding a can of kidney beans to the mix and using kale instead of collard greens. I will definitely be making this again. It IS very rich – I should have served mine with rice instead of being a pig and just having a double portion! Next time I will try your suggestion of lime juice, I think that would cut through the sweetness nicely, and add a bit more chilli. Great recipe, thank you – I know my husband will love it too. So glad it could be adapted to your liking! Thank you for the review, Ali! I froze what I had left over last week (it froze really well) and my husband and I had it last night over rice. We used your suggestion of lime juice, which worked fantastically well – a real hit with both of us, thank you! We will definitely be making this regularly. Started out looking for a way to finish the last of a peanut butter jar and some lonely sweet potatoes.Wow hit the mark with this one.Gone in one day thanks ! This was wonderful! I decided to purée the soup with an immersion blender before I added the collards. It made a nice and creamy texture. The flavors are fantastic. The le juice at the end was great too. Instead of rice, I served it with cannellini beans. Yum. Thank you for the recipe! Yes! Delicious. I didn’t have collard greens but used spinach and it tasted great. This sounds amazing. How strong is the ginger taste though? I really dislike the taste of ginger. I don’t think it’s all that strong but you can just leave it out if you don’t like it! I’m so happy to hear that! Thank you, Liz! This sounds wonderful! How long do you think it would need in the slow cooker? A few hours, then add the greens just before serving? I haven’t made it in the slow cooker so I’m not sure. A few hours should be sufficient, however I find things to be less flavorful in the slow cooker so just keep in mind it might change the results! I’m so glad to hear that! Thank you for the review! I made this recipe, but swapped out 2 cups of the veg broth for two cups coconut milk, to give it a richer flavor. Turned out delicious! Delicious! For extra nutrition, as well as volume, I doubled the chard and diced the stems. I added the diced stems to the potatoes, prior to adding the leaves. I omitted the jalapeno, because my elderly in-laws aren’t keen on it, but I did use a bit of jalapeno infused olive oil. I don’t think any of us expected to like this as much as we did. It’s truly unique and delicious! I was hoping for left-overs but alas, it wasn’t to be. The five of us quite happily devoured it! Looking forward to making it again. based on what produce and such are on hand, I’m sure a million variations could be made. I’m writing this one down, it’s a definite keeper. This soup looks amazing. The peanut butter will provide some protein, but mostly fat. Do you have a suggestion for a protein that can be added? 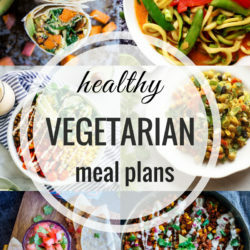 Vegetarian is preferred, but not necessary. For example, chicken thighs seem like a good addition. Thanks. I love following your blog. Made this for the first time last night, and it was so delicious! 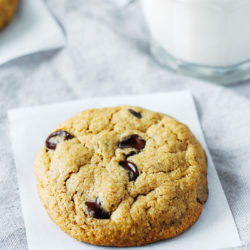 It’s very flavorful and warming without much heat (although we don’t mind heat), and it was a big hit with my 8-year-old who doesn’t always love peanut butter. 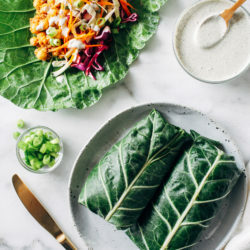 I’m not generally a huge fan of collard greens, but they were perfect in this. Served it over couscous and topped with a squirt of lime and some chopped peanuts. I’ll definitely make this again! Delicious! 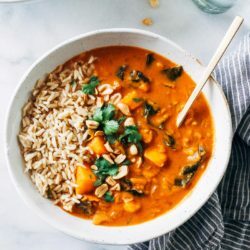 I tried another recipe for African peanut stew about a year ago and it wasn’t a keeper – – THIS recipe is definitely a keeper! I’m planning to make it again today. Thanks for the recipe! What would adding chickpeas to this recipe you totally ruin it? I don’t think so! You could always try adding some to a bowl of the stew and see if you like it before committing to the whole batch.